People from over 200 countries have made Australia their home, and 43% of the population was either born overseas or has at leas one parent born overseas. Harmony Day on March 21st, celebrates Australia's diversity and promotes the social, cultural and economic benefits provided by Australia's cultural and linguistic diversity. 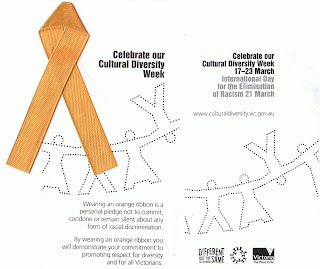 Harmony Day is part of the Australian Government's Living in Harmony project. It also coincides with the United Nations' International Day for the Elimination of Racism. Australia's first Harmony Day was held on 21st March 1999. An orange ribbon is the symbol of the day. It shows that Australians believe in a culturally diverse society. Schools, educational institutions, sporting bodies, community organisations, government and businesses get involved and organise events to celebrate Harmony Day. The Government's Harmony Day website offers further information, including a list of special events.